HBO's upcoming series Luck is being touted as the next Sopranos. Luck is all about horse racing. Chantal Sutherland is in it too. She plays an exercise rider. Horse racing definitely has a seedy side. Always has. And this series will definitely magnify it and blow it out of proportion. But so what? Some say there is no such thing as bad publicity (I'm not sure Barbaro's demise helped horse racing), I think that statement is very true here. As long as the show has some focus on gambling (and the preview indicates it), I think this will be good exposure for the game. The key is that no matter how shady some of the gamblers are, if they even give an inkling that the game can be beat in the long run, it just may spark viewers enough to create new Horseplayers. Pull The Pocket has a good post up on positioning horse racing from a marketing stand point. Conclusion, way too many cooks without a clue. There are right answers out there, but those who have a say today, give the wrong answers and worst of all, act on them. HANA (Horseplayers Association Of North America) has organized a late PICK for Pool Party. Track takeout for Western Fair's Pick 4 is 15%. On that night, Canadian Horseplayers through HPI will get 10 times rewards on triactors. 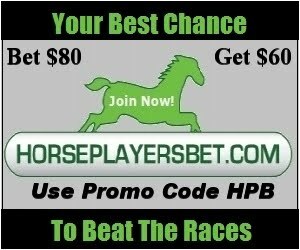 Most American Horseplayers can get a great deal too at ADWs like Horseplayersbet.com. Here is a free program from Western Fair's site for Friday night. I hope this video embeds well. You may have to click the arrow a couple of times if it doesn't work the first time (it should open within the blog post eventually so close any popups). I love The Beverly Hillbillies and caught this episode a few weeks ago on TV. This is classic horse racing comedy. Don Rickles helps. The real good stuff starts at around the 11:45 mark. Jed Clampett's system: "I just pick out the horse that looks like he can outrun the others." I think there are a few Horseplayers who handicap that way these days. With the flagrant use of concoctions and treatments like hyperbaric oxygen chambers, it might be the best way to make money. The past performances become less and less of a reliable tool. "There must be 50,000 people here." Thems were the days. Takeouts were around 15%, and there was plenty of churn because you could only wager on a handful of exotics each day. Some Horseplayers could actually leave the joint with more money than they came in with. Player Reward Bonuses could be the difference to you as to whether you win in the long run playing horses, or lose. Sure, you still need skill and luck as well to succeed, and at HORSEPLAYERSBET.COM at least you have a fighting chance. And one thing is for sure, your money will last longer because of the PLAYER REWARD BONUSES you receive. Monmouth had very good success last year with the 50 Cent pick 5 (though it was introduced back in 2007). Much of the success was due to the fact that eyes were on last years meet because they raised purses a bunch and wound up with pretty good field size on top of it. The low takeout didn't hurt either. And not having a Pick 6 most probably helped as well. Turf Paradise also has had a 50 cent Pick 5 for a while too. But on carryover days, they are lucky to hit $12,000 in total pool. Still, after watching what happened at Monmouth, Gulfstream Park decided to follow suit, and it looks like it was a factor in helping them have a very good meet relative to the industry the past winter. Calder and Hollywood Park have now joined the show with low takeout Pick 5's, while Arlington and Churchill Downs added 50 cent Pick 5's to their menus too. Hollywood Park needed to do something to say that they still care about the customer after California increased takeout on exotics to 22.68% on doubles and exactors and 23.68% on all other bets (an increase of 10-15% from 20.68%). Calder wanted to give Horseplayers a reason to play that track (their takeouts are in the stratosphere), so they put out a 12% 50 cent Pick 5 this year. To me, as I've stated before, the Pick 5 is the last reason for me to handicap a card. Once I handicap a card though, I might play it if it looks like something I can cash. Tracks like Hollywood and Calder are banking that Horseplayers will handicap the lower take Pick 5's. and then will make other wagers on these cards. Of course, carryovers on the Pick 5 help tremendously, but at a 50 cent minimum and when fields are on the small size, they don't happen too frequently. Hollywood was lucky enough to have one the past week, but don't expect many more in the future. Monmouth hardly had many last year, even with larger fields. The low takeouts attached to these Pick 5's are insulting to me actually. Pick 5 winnings are least likely to be churned as payoffs are usually on the high side. If track execs were even remotely interested in growing their business, they would lower takeout on higher churn bets like exotics like doubles, exactors and Pick 3's. More and more smaller tracks are likely to give these Pick 5's a shot, and I think it is a mistake if they go the 50 cent route. First off, the hope for smaller tracks is a larger carryover, and that is why I think they should opt for a dollar minimum. I would rather see dollar Pick 5's at tracks like Louisiana Downs, Mountaineer, etc. who have Pick 6's that need months to build, and they rarely, if ever have a Pick 6 carryover that catches the eyes of players from around the USA and Canada. I believe that Pick 6's should only be available at California A tracks and possibly NYRA tracks. As for the Fortune Pick 6 Jackpot bet that Beulah introduced and Gulfstream added this year. I like them, only because they can attract slots and lottery players possibly, and some of these players might cross over to horse racing. However, I would make mandatory payoffs happen a lot more frequently...not just the end of the meet. Mandatory payoff dates are when real money is bet on this type of wager. Once every three to four weeks should do the trick. Again, a low takeout isn't important on Pick 5's or Pick 6's. Tracks, especially smaller ones, should look at some of their wagers that attract low pool size, for example, like Fort Erie's Pick 3's, and reduce those bets as a stepping stone towards doing more reducing down the road if successful. And one more thing, when it comes to Superfectas, I hate the dime or twenty cent minimums that are out there right now. 50 cent minimums like Mountaineer has are just fine for most gamblers. The idea of superfectas in the first place was to give players an opportunity at a large hit. 10 or 20 cent supers at high takeout rates just wipe players out a lot faster as they usually wind up with exactor or triactor payouts anyways if they cash a super in most cases. Also, supers should not be available in races that have less than 8 horses. Again, all this does is dilute pools and break customers faster (takeouts of 25% are usually associated with supers). It is one of the reasons why horse racing is dying right now. I just finished handicapping the Kentucky Derby, and other than Uncle Mo (will he or won't he run), this field has the same proven ability of a typical Non Winners Of One Other Than at Woodbine. The field is so blah that Mine That Bird would look bettable in the 2011 Derby. Uncle Mo towers over the field based on peak speed figures. His last race though makes him questionable, as his final speed number ranks right in with the rest of the herd. I've altered the way I handicap big races, so my second choice (who might wind up being my first choice if Mo is scratched) would have been a horse I eliminated last year. Master Of Hounds pulled off a decent speed figure (compared to the rest of the Derby field) in his last race at Dubai (according to TrackMaster ratings). The thing is that he is racing on a 40 day layoff. He has never tried a dirt track, and at the time of this writing has no published workouts since November (is he even eligible to run?). Taking away all the negatives, there is some good theory behind playing Master Of Hounds. American based horses ran horrible at Dubai. Maybe they couldn't handle racing without the meds that are allowed on this side of the ocean. With the proposed ban on race day meds possibly looming, I find a sense of inner satisfaction (it has something to do with provocation and chaos) to see this European invader come to America and use Lasix for the first time. The horse is definitely bred for the distance, and has a good post and good jockey. The other horses I will likely throw in are Nehro and Santiva. But handicapping this Derby is like throwing mud against the wall. Even with Mo in the race, I'm expecting to see gigantic exotic payoffs. There were 7.5% less race days as well. Less isn't better. Purses were up slightly. Why? Mostly because of artificial increases in California as well as the addition of slot money to purses at Gulfstream. A few tracks did buck the trend with handle increases: Keeneland, Gulfstream Park, Tampa Bay Downs to name a few. The bottom will come out of the purse increase in California soon though. There is no way they can maintain a purse hike with consistent 20% declines in handle since they imposed that foolish takeout hike at the beginning of the year, which was met by an unprecedented Horseplayer's Boycott. Even though, little has been mentioned lately about the Boycott, handle is still getting slaughtered which leads me to believe that the natural forces of the takeout increase (players not having as much money to churn, and getting turned off quicker) coupled with higher signal fees (which turns off anyone who gets rebates) has taken its toll. The longer California doesn't rescind the takeout hike, the harder it will be to win back the players who have gone elsewhere. Here is a copy of the bill. It is very strict and provides very little wiggle room for anyone who is looking to do anything but feed oats and hay and water. I'm curious if this is adopted in the US, if Canada will follow suit. I would have to say that Woodbine would comply, even if they don't have to. Would the ORC automatically make the US rules Canadian rules? It is an interesting hypothetical. Canada could become a haven for real bleeders and outfits that don't want to play by the new proposed rules. Norm Borg interviews new announcer Mike Dimoff as well as Elissa Blowe. Listen here. Great to see they acquired the services of Jennifer Morrison to make the morning line. I doubt we will see Nick Gonzalez trained horses at 12-1 or higher anymore in the program. Fort Erie is trying (in every way but the right way), however with a track takeouts of 26.3 on exactors and doubles still, I don't see them doing anything but swim against the tide this year. Fort Erie will still do well with US Horseplayers who receive rebates, and may pick up some of the ex California crowd, but other than that I think they are destined for around a 5-10% decrease in handle this year. Something they can ill afford. Horse racing is about gambling, not about music or cheap hot dogs. Sending their patrons home broke quickly (that is what high takeouts do) doesn't bring them back very quick, nor does it the plant seeds of future Horseplayers. Many tracks have added new low takeout gimmicks. Fort Erie needs to do at least that. But still, 26.3% on doubles and exactors????? What are they thinking? The betting public is way more in tune with track takeouts than ever before. I wish them all the luck in the world. But I'm afraid that luck won't cut it.